In 1957, two novels were published that were destined to have a profound effect on the future of the United States, and indeed, the world, effects that would long outlast the lives of their creators. The first was Atlas Shrugged, by Ayn Rand, and those who read it and felt that is was "speaking directly to them" went on to become Republicans, vulture capitalists, the kind of self-absorbed greed mongers epitiomized by Gordon Gecko and empathy-eschewing rightwing politicians epitomized by Paul Ryan, who wants to get rid of Social Security. We also became, by and large, those who didn't burn out, liberals and Democrats. On the Road is broken into five parts, but only the first four feature the extended road trips that the book is famous for. I've created interactive maps for each of the four road trips in the book. Map One -- Summer 1947: New York to San Francisco by way of Denver, and back again. These are Google Maps and they are zoomable. Click on one of the placemarkers on the map to see a quotation from the book, zoom in it to see the location on the map. In many cases where the narrative wasn't clear on a given place, I've had to approximate -- apply a "best guess" solution to a given location. There is also a link on each map to allow you to view a larger size on the Google Maps site. The automobile and other forms of motor-driven transit figured prominently in On the Road, as it did in Post-WWII America. But no one who has read the book can forget three vehicles that figured prominently in the story. These are the only three vehicles that are identified by make and year in the whole book, and there was a reason for that: The cars themselves became sort of minor characters during the course of the adventures. 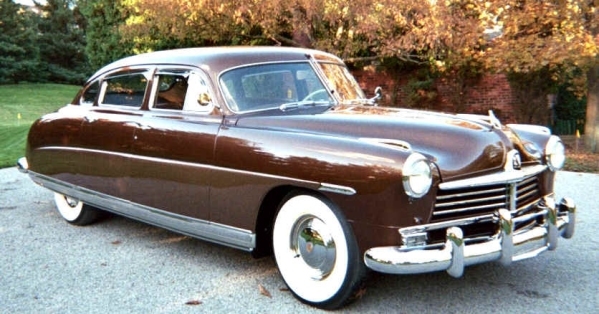 In the second trip, starting actually at Xmas 1948, Dean Moriarty (Neal Cassidy) shows up at the house of the brother of Sal Paradise (Jack Kerouac) in "Testament, Virginia" (really Rocky Mount, NC) in a brand new 1949 Hudson. 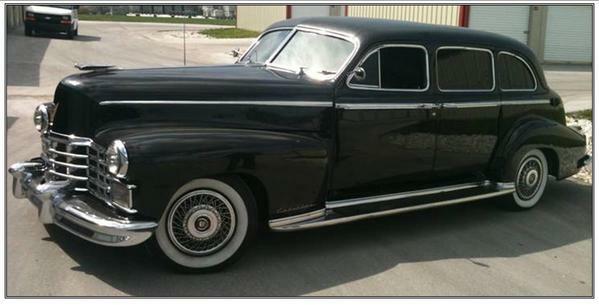 This is the car in which they blast off to New Orleans and the West Coast, January 1949. Like all of Dean's cars, this one really took a beating. In the third trip, Dean and Sal score a "driveaway" car at a travel agency in Denver, for delivery to a ritzy Lakeshore address in Chicago. Needless to say, the car is somewhat the worse for wear when it finally gets home. In the fourth trip, this is the rattletrap car that gets the boys to Mexico City. It also, offstage as it were, gets Dean back as far as Louisiana where it finally gives up the ghost. It always comes a surprise to readers who first read On the Road to learn that Sal Paradise spent hardly any time hitchhiking. When he couldn't boost a ride with Dean, in the cars listed above, he was comfortable in taking the bus. He logged many more miles on Greyhound buses than he ever did beating his shoe leather hitchhiking. 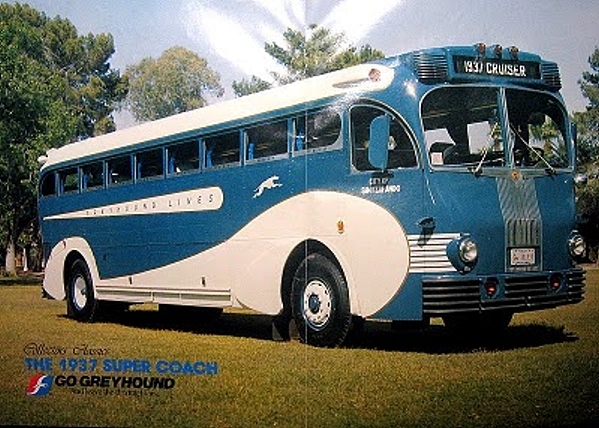 This is an example of the buses that, while they were ten years old or more at the time, were still rolling on American highways in the late 40s and early 50s. Note: These links to other websites are not -- and could never be -- all inclusive. Do your own search and stumble onto some terrific sites that deal with the phenomenon that was -- and remains -- On the Road and the Beat Generation. Footnote 1: "Fringies" may have been just a Seattle or West Coast phenomenon. I dropped out of college in early 1964, which was at the start of the Fringie movement in Seattle's University District, and I remember some great times hanging out, listening to folk music and drinking espresso coffee in the great Beat coffee houses that littered "The Ave", such as The Pamir House and The Edge. See Countercultural Seattle Remembers the Fringies for more information. Later of course we all became Hippies. These maps are brought to you by Dennis Mansker, the author of A Bad Attitude: A Novel from the Vietnam War, as part of my general "presence on the Internet" page, which you can click on here if you want more information.